At the end of last week Anette introduced you to Telia – a special small lot of experimental Costa Rican coffee that we’ll be releasing soon. As this is a very unusual coffee, we thought it’d be interesting to tell you about the test roasting and profiling process we’ve taken Telia through in the run up to it’s release. We develop individual roast profiles for all our coffees. These are essentially recipes detailing how we roast a given lot – what temperatures we want to hit, how long it takes to get there, that kind of thing. We design these by doing small test roasts in our sample roaster and then cupping the results to see if we’re happy with the flavours the coffee is showing. Is it tasting how we think it should? Does it taste over or under-developed? Are we happy with the balance of acidity and sweetness? Even once a profile is set and a coffee on sale, we’ll still constantly taste and assess the roasted coffee, refining and revisiting the roast profile if necessary to ensure the coffee is tasting its best throughout its short time with us. Telia was an interesting beast when it came to profiling however because it’s an Ethiopian bean, but the lot was grown in Costa Rica. I therefore had to consider whether we’d roast it like an Ethiopian coffee, or like a Costa Rican – both would be quite different. The fact that this was such a small lot added an additional complication, as each time we roast a test batch of a coffee, that uses up some of our stock, so we have less to sell! My instinct going in said to treat it more like an Ethiopian than a Costa Rican. This meant erring towards a high starting temperature in the roaster (around 210°C) as this helps get heat into the traditionally high density Ethiopian beans. I did need to moderate this a little however – Telia is a white honey processed coffee grown at 1500m (compared to the 2000m that’s typical in Ethiopia) so the beans aren’t likely to be quite as dense as a fully blown Ethiopian. Additionally, I needed to consider development time – the time the beans spend in the roaster after first crack has happened. As a general rule of thumb, Costa Rican coffee likes a little more development time than Ethiopian coffee, again because it’s grown at lower altitudes, so we tended towards a longer development period in our first test roasts. What we’ve ended up with is a very interesting coffee, and certainly one unlike anything I’ve profiled before. In the roaster, it behaves mostly like an Ethiopian, and as we’ve done more test roasts we’ve found the end coffee better when we push more towards the quick style of roasting with shorter development, typical of beans from Africa. In it’s flavour profile it shows both its African heritage and its Costa Rican origin – we’re getting a lot of sweet, juicy flavours off it, with common tasting notes being things like blueberries, cola bottles and baked meringue. We’re also getting some more unconventional descriptors that hint at the coffee’s experimental nature, such as menthol and eucalyptus, both of which give the coffee a striking freshness on the finish. As Anette has said previously, we’ve decided to do something different with this coffee and make it only available through cafes. We’re big supporters of the London and UK cafe scene, and this is our way of giving something back and encouraging you to explore your local speciality coffee house. If you want to know where the nearest cafe that serves Square Mile coffee is just check out our Where to Drink Our Coffee page. 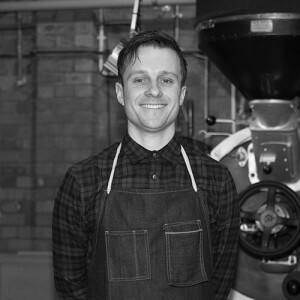 Tom Flawith is our head roaster. He has worked in coffee for 6 years, you'll most likely find him either working the roaster or standing over a cupping table.